I could use a cup of coffee, how about you? 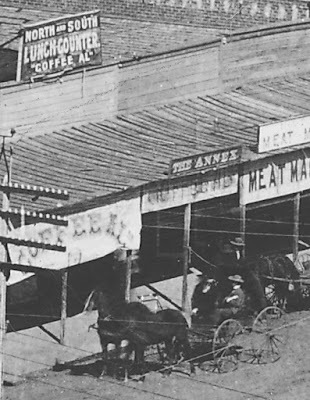 It's 1899 and we're just west of Phoenix Arizona, and there are a lot of places in town, but my favorite place is Coffee Al's. If you don't mind hitching up Autumn and Rapunzel to the wagon, I'll go see if I can find some money. My parents left some greenbacks sitting around here, and I guess I'll use them in town. Most people only accept silver and gold coins, but these will have to do, hopefully they'll pass, because I need to get a lot of stuff in town. What's this? An old Confederate coin? Wonder if it's worth anything now? Probably not. Let's get moving. The sun's coming up and we're going due east, so I'm going to tip my hat over my eyes and let the horses just find the way. When we get to that area where the Cave Creek floods I'll know that we're almost in town. I understand that those darn fools are building the Capitol Building right there. Here we are, entering the edge of town, just a little ways to go. There. I can see Coffee Al's, which is just west of Center Street. Boy howdy, I could sure use a cup of coffee! I think that cheap whiskey that I had last night has given me a little bit of a headache. Nothing better than a cup of coffee for that! Let's just stop right in front. Washington is very wide, I don't think we're going to get in anyone's way. The wagon's empty so we can both go in. That was great. A little bit of coffee was what I needed. And I didn't realize that I was so hungry, so I got us some sandwiches, here's yours. Now let's go get those supplies. 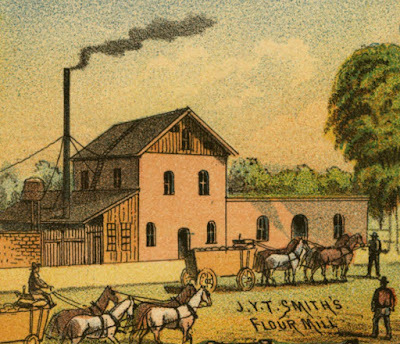 John "Yours Truly" Smith's Flour Mill in 1885, Phoenix, Arizona. OK, time to head back. I'm glad we came into town this morning. Ma will be especially happy with the nice fresh bag of flour that I got. Milled by J.Y.T. 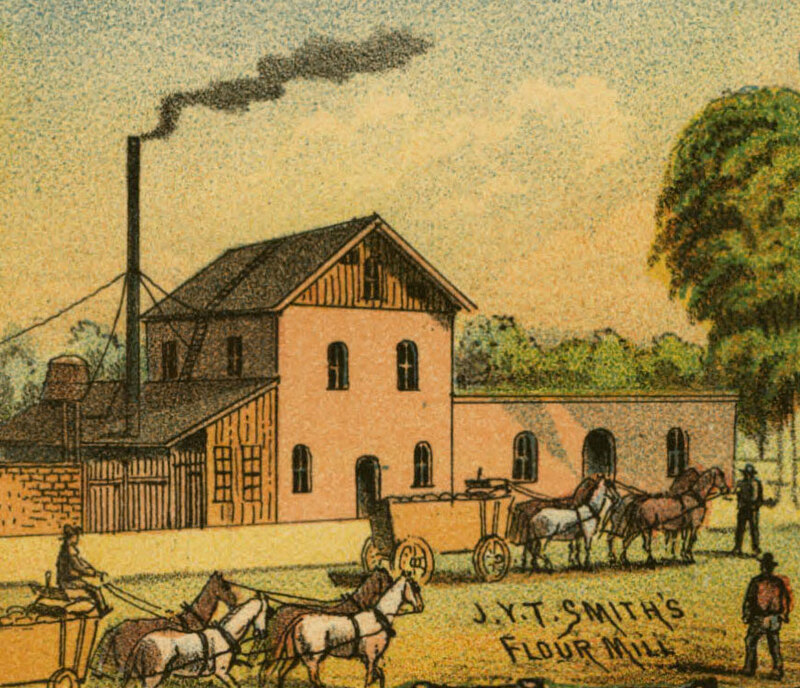 Smith - best in town! I hear that the flour that old man Hayden makes out in Tempe is pretty good, too. And I know what you're thinking, another cup of coffee would be great before we head back west. 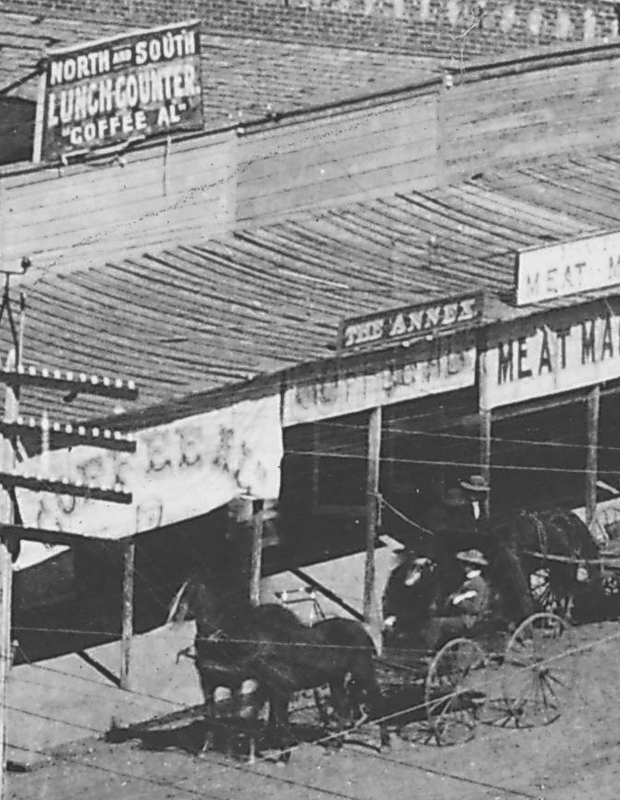 But don't worry, there's another Coffee Al's on the north side of Washington, so we don't even have to turn the wagon around, or walk across the muddy street. How convenient! I wonder if people in the twenty-first century will have such convenient places to get coffee? The Territorial Capitol Building was built at 17th Avenue and Washington, and the building is still there, as a museum. The Cave Creek flooding was finally fully controlled in 1994 with the completion of the Diversion Channel along the Arizona Canal. And Phoenix is still a convenient place to get coffee. Image at the top of this post: the Coffee Al's on the north side of Washington, just west of Center (Central). The other location of Coffee Al's was, of course, on the south side of Washington.